Monday was an American holiday: Martin Luther King, Jr. Day. 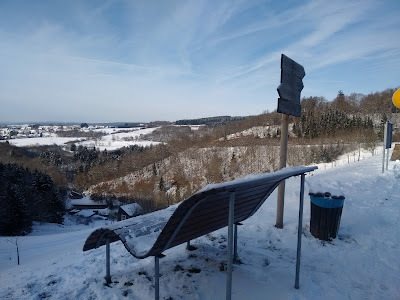 An American friend and I planned to do something together to celebrate the holiday (and to be more honest, the day off) and she suggested that we take a hike along the Planentenwanderweg Nonnweiler. I vaguely remember reading something about this in another expat blog and agreed. Winter has finally arrived in southwestern Germany so it made for a rather cold hike today at about 20 degrees Fahrenheit. However, I'm a glutton for winter punishment and actually celebrated the cold. It must be my Michigan roots at work. After layering up, I picked up K and drove us up to Nonnweiler. 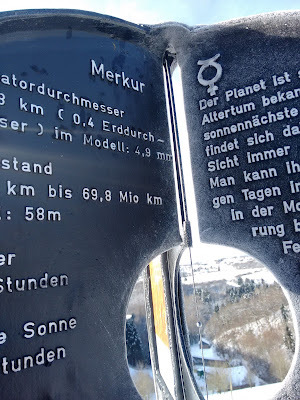 I was pleased to see some snow up there; we had hardly any in Kaiserslautern. Yay! 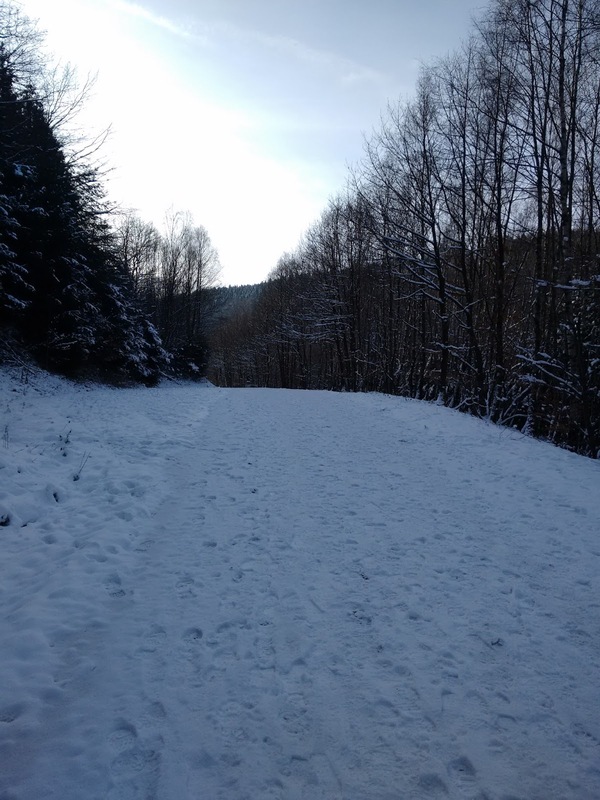 Snow, along the wide and hiker and bicyclist-friendly trail. The Planentenwanderweg is a trail that circles the Stausee Nonnweiler, a reservoir in the Nationalpark Hunsrück-Hochwald. As the name suggests, this trail also offers a special feature: a scale model of the solar system. The model starts with the sun at bridge over the reservoir. From there, one makes a circuit and encounters the other planets. Since everything is scaled, wanderers on the path are technically traveling at the speed of light, at least according to the tourist bureau's website ;) I don't think that we were anywhere near that fast because our legs were stiffening with the cold. It all begins with the sun. The gravel path is wide and easy to traverse. However, if one wishes to traverse the entire solar system, it's a rather long walk since the final planet (or downgraded whatever it is -- Pluto) is across the reservoir. We had originally thought that the path would be around 5 kilometers or about 3 miles. It seemed way longer than that and indeed, it was. We ended up taking the 11 kilometer route all the way around the reservoir! 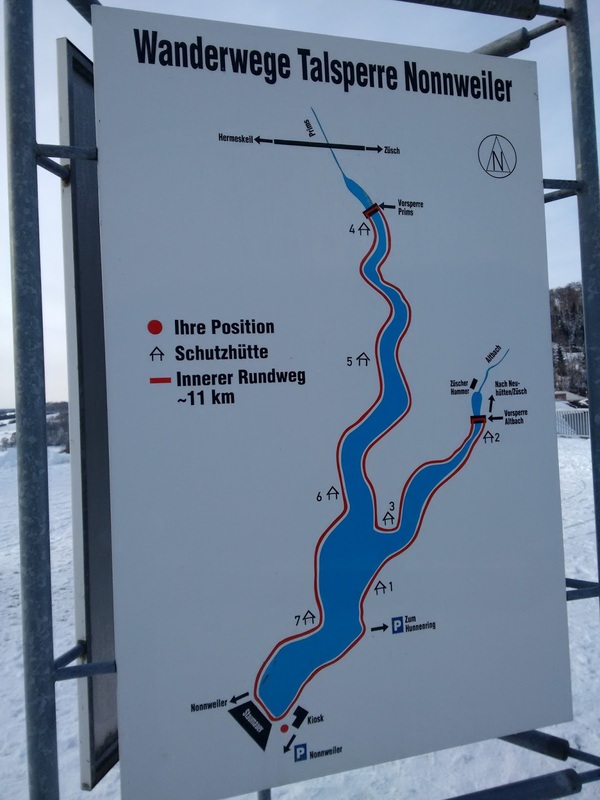 There's even the possibility to take a 17 km route. Oy vey. 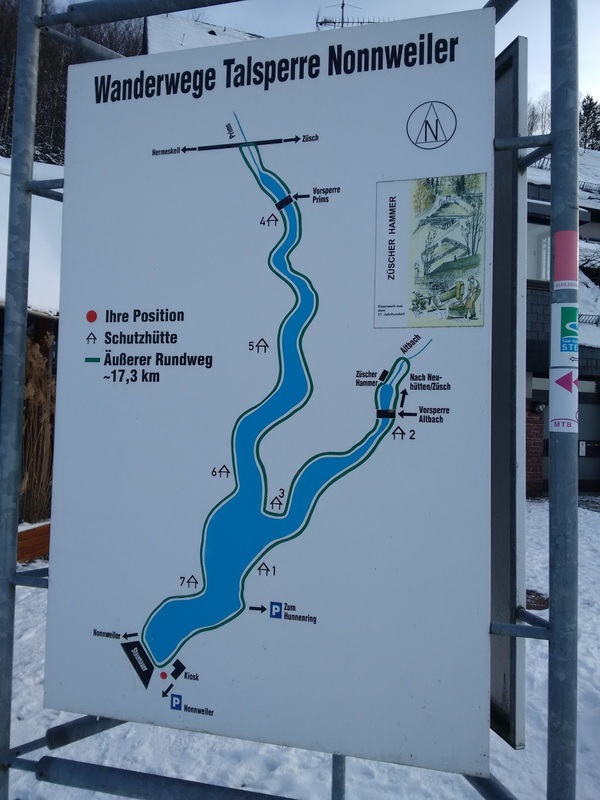 I definitely recommend studying the maps near the kiosk/bathrooms at the beginning of the trail to decide which route and distance to take. There are benches and picnic huts along the trail. As we labored around and across the reservoir, we encountered all of the planets. 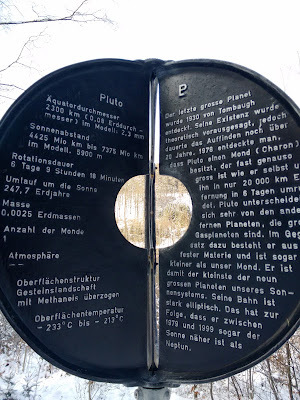 Most of them are at the beginning and each station includes a model of the planet on a stand with more information and pictures. As can be expected in Germany, all of the descriptions were in German. 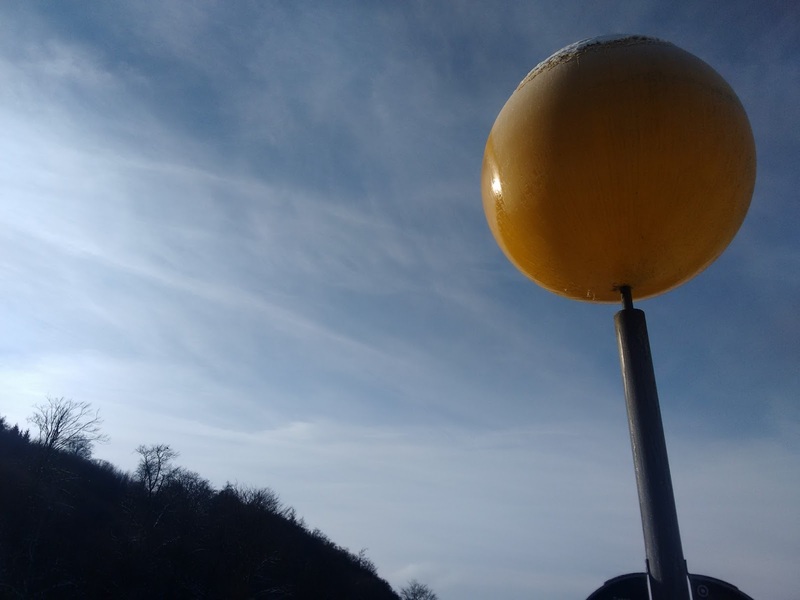 It is interesting to combine a hike while "exploring" the solar system; by the time one reaches the final planets, the immense scale is really apparent. We were wondering if we'd ever get to the end of the planets! Model of Mercury (about the size of a BB); it struck us as funny after how big the sun was! We were especially interested in seeing if the information about Pluto had been updated since it had been downgraded to a dwarf planet. We found that the solar system model kept mum about the change. Maybe the model maker is still in denial. We enjoyed our hike around the solar system but did wish that we had studied the maps better before taking our path. We kept wondering if we had missed a turn-off somewhere. The path is not that confusing but seeing the maps first would have helped a lot more. -Dress for the weather! It was even colder by the reservoir with the cold air blowing over the water. -Study the maps of the trails first and decide just how far you want to walk before you start. The shortest path is probably to walk to Pluto and come back the way you came. 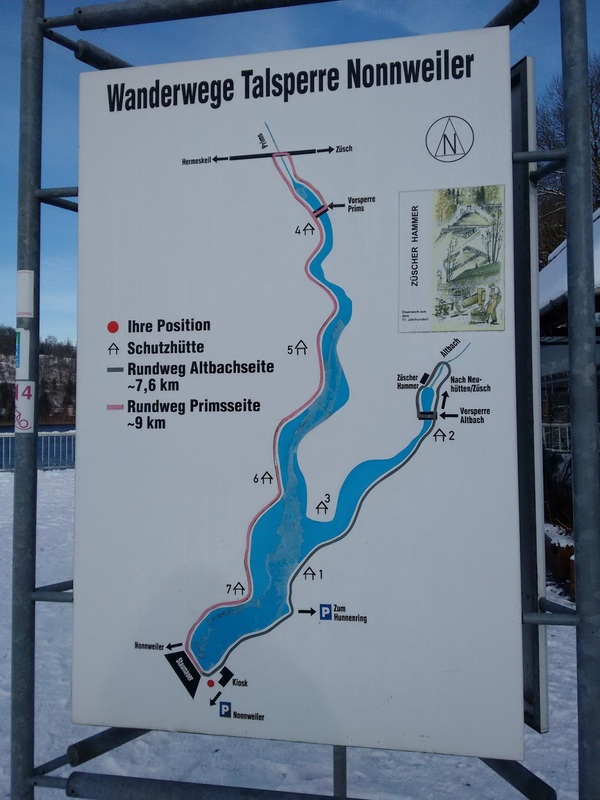 -If traversing the path clockwise from the beginning (by the sun), take the first bridge on the right to cross the reservoir. It takes a while to get there so don't be too surprised! -There are bathrooms (heated, reasonably clean, and lit) at the beginning of the trail. In the warmer months, the kiosk is open too and sells snacks. 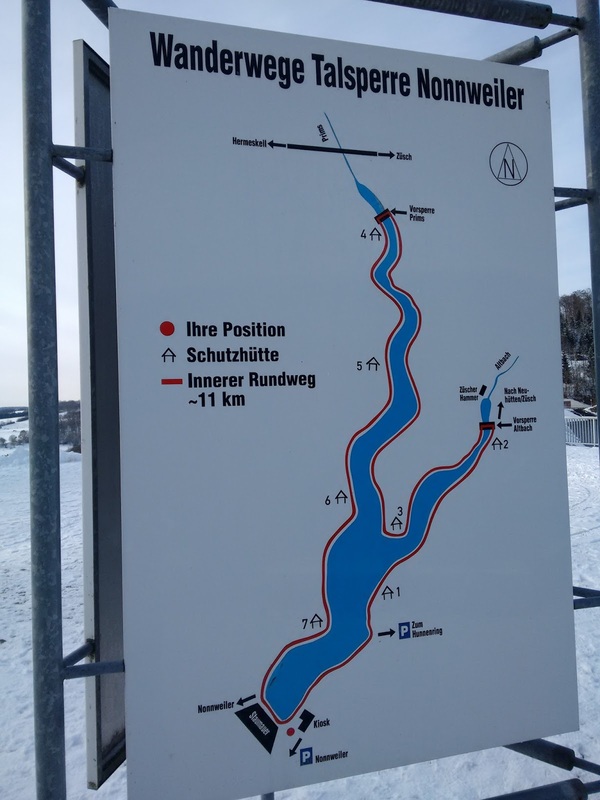 -Follow the signs for Nationalpark Hunsrück-Hochwald; to reach the reservoir, take the steep road with the sign that's just outside Nonnweiler. -The trails are very wide and well-maintained. They're pleasant for both hikers and bicyclists. -Dogs must be leashed at all times and swimming in the reservoir is not allowed because it supplies drinking water. Here are the maps so you can pick your route first.